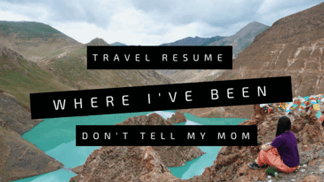 Home Travel the world Europe Best Day Trips from Athens – Do it yourself! From the Greek capital, it is easy to do some beautiful, exciting day trips to nearby sights like Hydra, Meteora and Delphi. 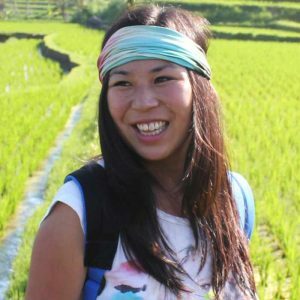 There are many tours of offer, but as a backpacker, I prefer to travel by public transportation. 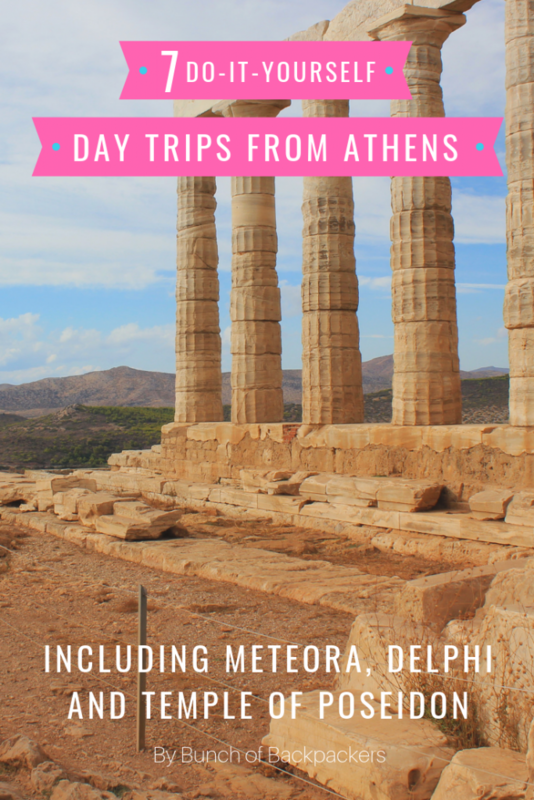 Together with some fellow travel bloggers, I selected some of the Best Day Trips from Athens to do yourself (no tours!). This way you will save money and you know what? It’s often more fun to get there independently! Parnitha National Park on the northern outskirts of Athens is one of the best choices for a quick and easy escape from the city. 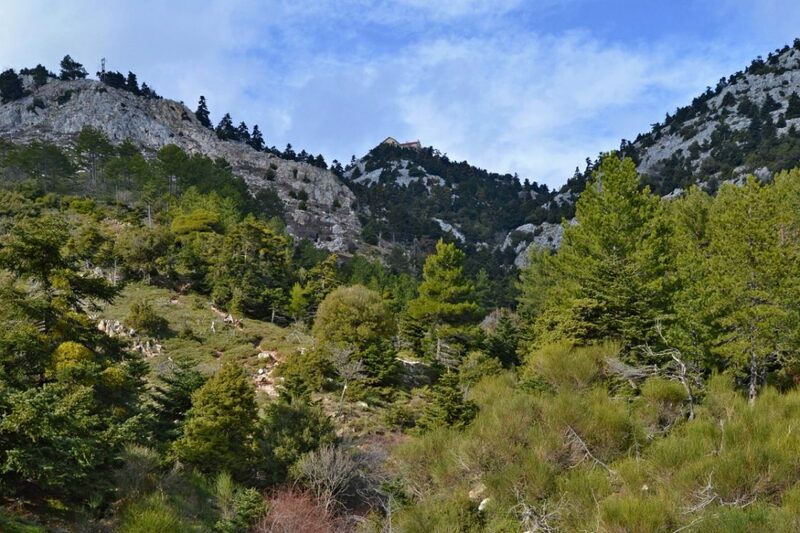 With a bit of creativity it can still be reached by the Athenian public transport, but walking on the forest-clad slopes of Mount Parnitha you’ll feel miles away from the busy Greek capital. There are many marked trails crossing the mountain and two mountain huts offering simple accommodation and tasty meals. Finding the beginning of the trail is not always easy though and picking up a hiking map of Mount Parnitha in one of the bookstores in Athens is a good idea. 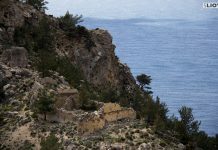 HOW TO GET THERE – If you have a car you can drive all the way up to the mountain huts at Mpafi or Flamboury and enjoy a stroll through the upper parts of the mountain. Otherwise, take the bus no. 504 from the metro station at Kifisia and get off at the main square at Thrakomakedones (1.40 for the ticket). From here, you can either hike to the top or enjoy a free (!) cable car ride to the Regency Casino high up on the mountain. It is a surreal feeling starting your hike in a casino but it is worth it even if just for the stunning views across Athens from the gondola. Another way to enter Mount Parnitha is through the neighborhood of Fili at south taking a bus no. 723 from Ano Liosia. This side of the mountain is much quieter and pristine, popular mainly among more zealous hikers and rock climbers for its rugged trails and impressive cliffs. Either way, visiting Parnitha you’ll get a chance to leave the touristy things behind for a while and spend a day like a local alongside the outdoorsy Athenians. Just 25 kilometers from the Greek Capital, Lake Vouliagmeni is cradled away by stunning rock formations and impressive landscapes. But what makes it special is the therapeutic ability of its waters. This makes Lake Vouliagmeni a great idea for a day trip from Athens. 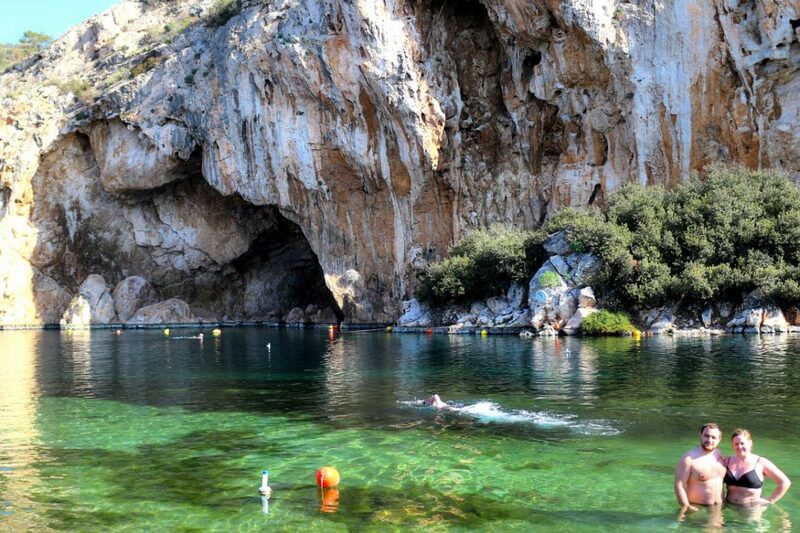 Also known as the Sunken Lake, Lake Vouliagmeni was formed from the collapsed roof of a cave thousands of years back. The lake is 50-100 meters deep and sits 50 cm above sea level. The brackish water contains different kinds of salts and minerals which are known to have healing properties – curing various illnesses such as skin problems, headaches, sciatica, and many others. The temperature of the water is constantly between 25-29 degrees Celsius no matter the time of the year. This is due to the fact that the water of the lake is constantly replenished by underground hot springs that sip from Mt Hymettus, and mixed with water from the sea surrounding the area. The combination of the warm temperature and the salts and minerals in the water offer a unique and relaxing experience to the swimmers as they enter rejuvenation of the mind and body and overall wellness for every time spent in the water. The lake is also host to hundreds of Spa fish that nip and nibble away dead skin to reveal a healthier skin underneath. This completes the spa experience in Lake Vouliagmeni. Around the lake are various facilities to cater to your needs such as sun beds, restaurants, toilets, and more. HOW TO GET THERE – Lake Vouliagmeni is a great idea for a day trip from Athens. It can be reached by taxi or by getting on a Hop on Hop Off Bus from the City Center. Likewise, take the bus numbered E22 near the metro with the bus route Elliniko (or Helliniko)-Saronida and stop at Limni. 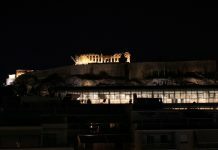 This Athens Day Trip option for independent travelers was brought to you by Karolina Klesta. Read her cool article with interesting facts about Greece! 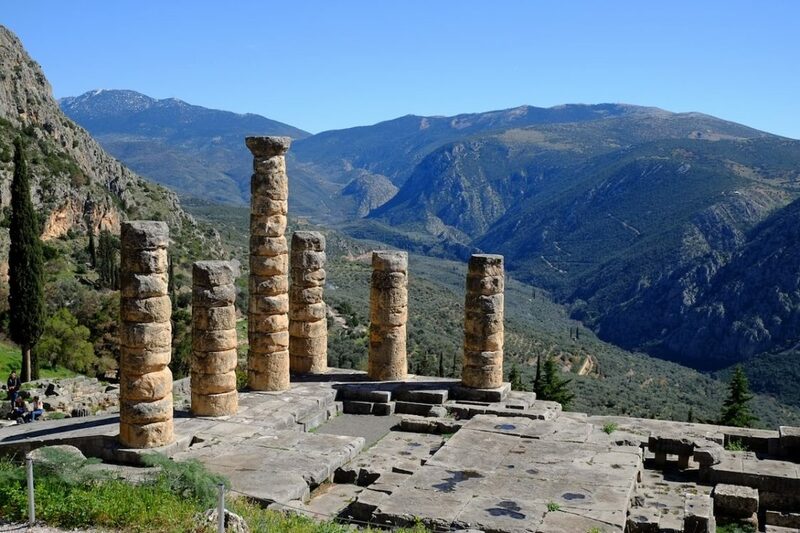 Situated high up on Mount Parnassus, there’s an ethereal quality to the mountain air at Delphi, once home to the most famous oracle of the ancient world. 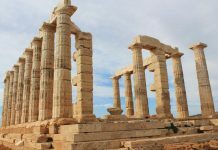 Undoubtedly one of the highlights of the Greek mainland, this beautiful UNESCO World Heritage site is close enough for a day trip from Athens using the bus – as long as you’re organized. HOW TO GET THERE – Buses in Greece are run by an umbrella organization called KTEL. Journey time to the town of Delphi is around 2.5 to 3 hours. There are only a few buses a day (depending on the season), but getting the first bus there (at around 7:30) and the last bus home will leave you enough time to visit the ancient site, enjoy the spectacular scenery, and find somewhere in town for lunch. The hardest thing about doing a day trip to Delphi is figuring out the buses, which cater to locals rather than tourists. To confuse matters, there several different bus stations in Athens and online information is patchy. The Delphi buses leave from Terminal B at Liosion (although do double check this whilst in Athens). Terminal B is not the easiest place to find if you’re not familiar with public transport in Athens so I recommend getting a taxi in the morning to take the stress out of it. If traveling in the summer you should book your bus tickets in advance. If you want to stay longer at the site or visit early in the day to avoid tours and school groups, then there are plenty of hotels in town for an overnight stay. 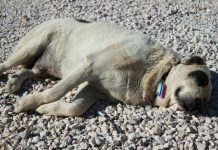 This is what I did, however there’s not much to do in Delphi in the evenings. With hindsight, I’d rather take a day trip but spend extra on a knowledgeable guide to really bring the ruins alive. If you are visiting the Greek capital, Athens and wish to get a taste of the island life — a day trip to the picturesque Saronic island of Hydra is a perfect treat. 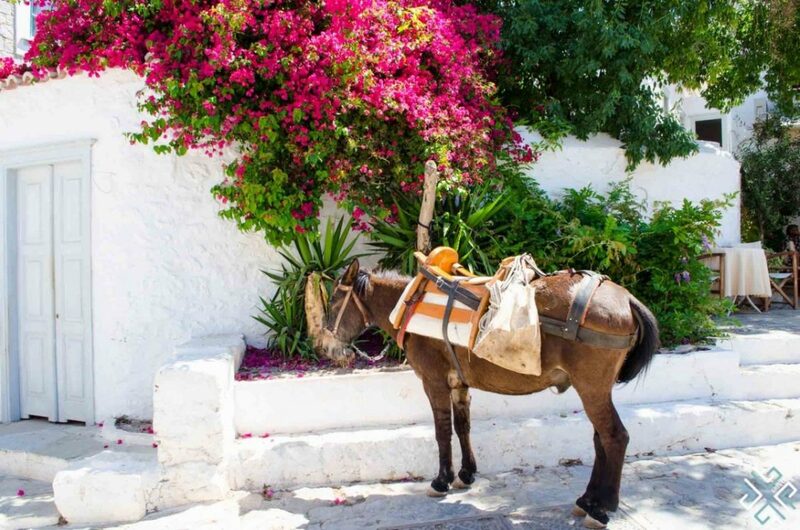 This quaint little island is only a short two hour ferry ride from Athens where you can wander around the cobblestone streets, take a photo of the donkeys which line the harbour and come across numerous cats. Hydra is a car-free island which makes it unique. In the 1960s Hydra gained worldwide popularity shortly after scenes from the movie Boy on a Dolphin, starring Sophia Loren were filmed and until this day it is one of the favoured destinations among artists. HOW TO GET THERE – You can either just visit the island of Hydra which will give you plenty of time to explore on your own, there are regular boats leaving from the port of Pireus (approximately 28 Euro one way) or alternatively opt for a three island day cruise where you will visit Hydra (spend 2 hours on Hydra), Poros and Aegina. 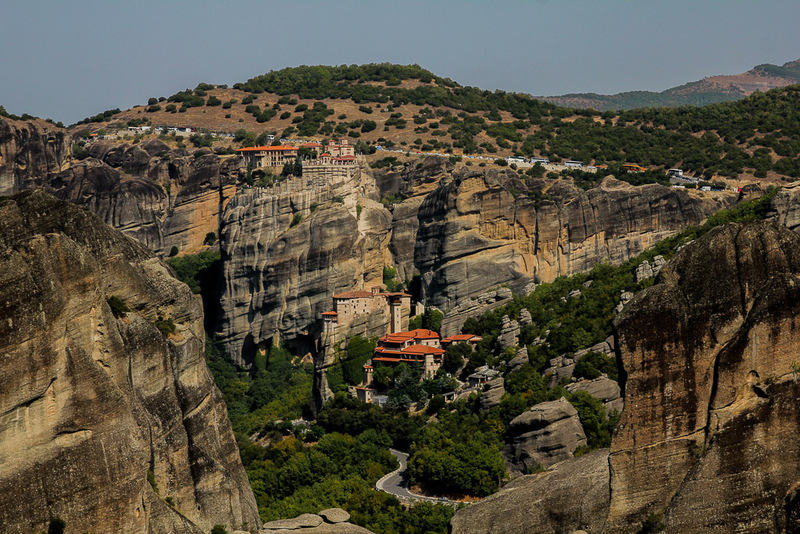 The Meteora Monasteries are located in central Greece about 4 hours north of Athens. They’re a stunning set of monasteries sitting high on cliffs that you can visit. They’re a UNESCO heritage site that are well worth a visit. A lot of people choose to overnight in some of the nearby towns but the trip is completely doable as a day trip which is what we did. HOW TO GET THERE – There are a number of ways to get to the monasteries including taking the bus or train, hiring a driver or driving yourself. If you’re more than one person my suggestion is to drive yourself. The road is very simple to drive and you’ll have a more independent schedule in terms of departure and arrival times. The bus and train tickets will vary depending on where you choose to depart from but range from 30-50 euros/person depending on time of year and type of ticket you get (based on our research from last year). Comparatively, car rentals start at 20 euros per day and can accommodate 4 people! Once you’ve arrived to the stunning monasteries you will have to pay entrance to each of them which is 3 euros per person per monastery and is only accepted in cash. Do remember to dress conservatively and to bring your camera because visiting the monasteries is pretty unforgettable and you’re going to want pictures. The nearby town of Kalambaka is located right below the monasteries which makes it an ideal place to grab lunch/dinner during your day trip! 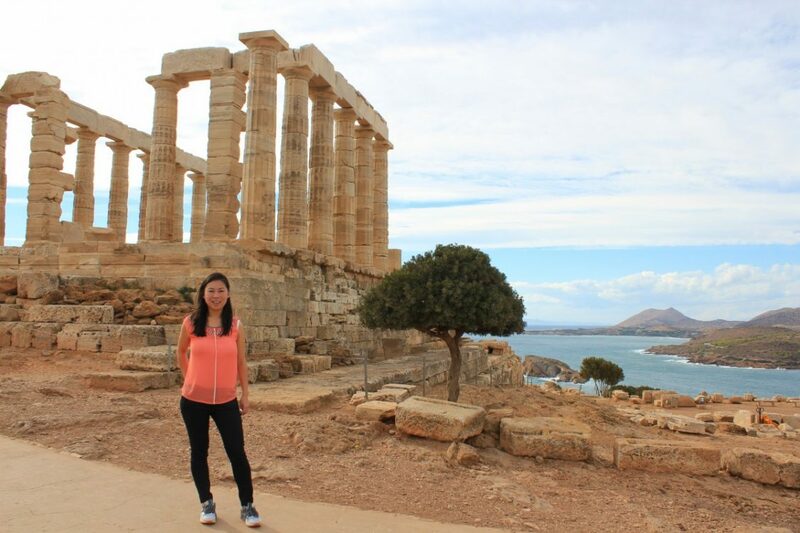 This Athens Day Trip option for independent travelers was brought to you by: Liliane Fawzy from My Toronto My World. 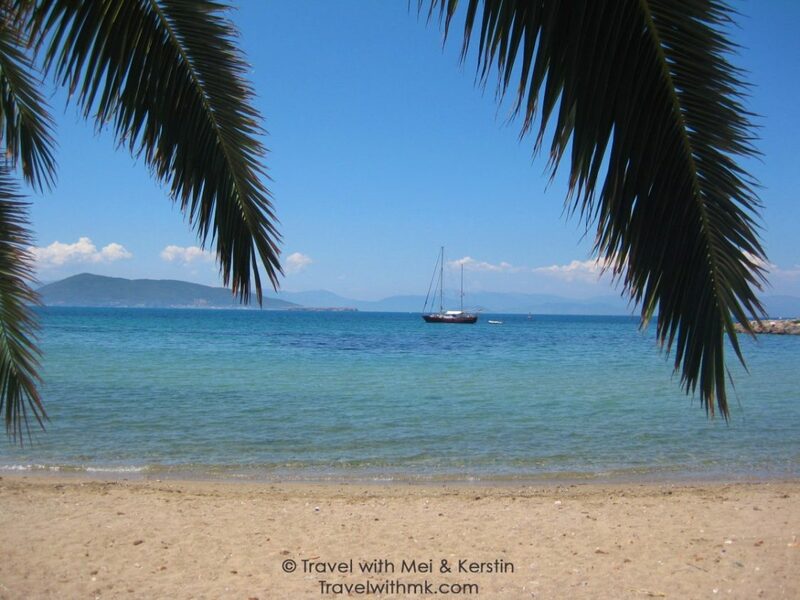 Located about 30 km from Athens, Aegina is our favorite destination for a day trip from the Greek capital. Once docked in the small port of Aegina, you can spend your day at one of the nearby beaches with crystal clear water or rent a motorbike to explore the island. Traveling around by bus is also possible, especially since the bus system in Aegina is quite easy. There are only 3 bus lines going to 3 different directions. If you’re history buffs like us, you might want to catch the Route 2-bus (blue line) to visit the Agios Nektarios Monastery and the Temple of Aphaia. You can buy on the bus or at the KTEL ticket office right across the port. Yachting, sailing, cycling, and horse riding are among other great activities on this island. If you have time, catch the Route 3-bus (orange line) to Perdika, a traditional fishing village in the south, where you can taste deliciously fresh food in a tavern before heading back to Piraeus and Athens! HOW TO GET THERE – To get to this Saronic island, you first have to travel to Piraeus, the main port of Athens, which can be reached by bus, train, taxi or – the easiest way – metro with the M1-line within 30 minutes. You can buy tickets to Aegina at the quay, but we advise you to book them online. The length of the journey to Aegina depends on the ferry you take: 40 minutes with a speed boat, 60-90 minutes with a regular ferry. Since the price difference is not huge (about 13€ for a one-way ticket with a speed boat, 8€-10€ for a one-way with a regular ferry), it’s definitely worth to travel with a speed boat. 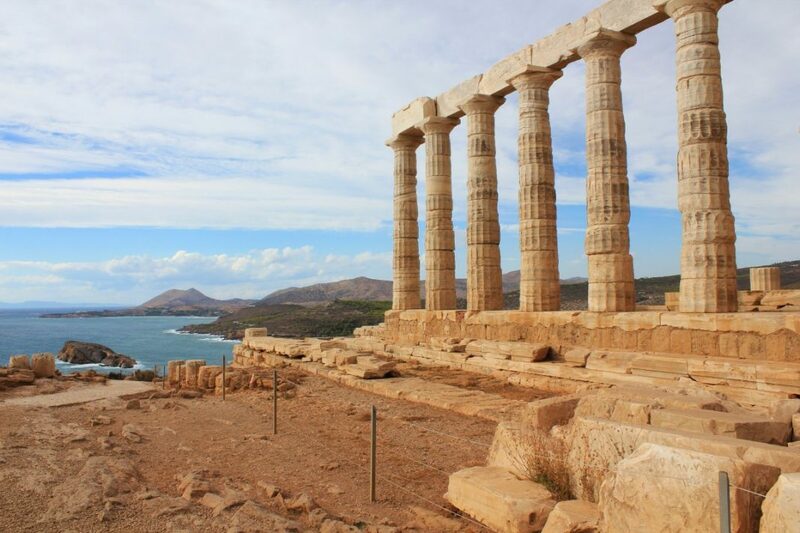 The temple of Poseidon (God of the Sea) was constructed in 444–440 BC. It is located on a stunning location: on top of a hill overlooking the sea. It is very easy to visit this temple by yourself from Athens. 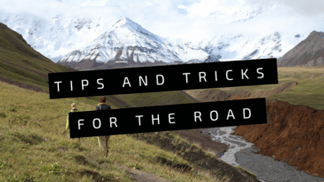 HOW TO GET THERE – Read all about it in this article. 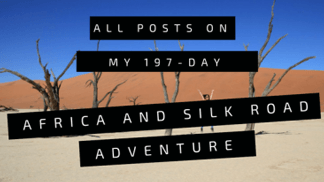 Previous articleHow to prepare for your Danakil Depression tour in Ethiopia? Next articleMoney Matters: How much does it cost to backpack Uganda and Rwanda?